You’re planning to install a vibration sensitive system (e.g. scanning electron microscope) or the vibrations of your machine are disturbing your neighborhood? Of course you can get advice from us. Our experienced engineers will work out a cost-effective feasible and tailor made solution for you. For objects being close to a vibration intensive system we will check and optimize the building layout geometry. We calculate the resonance frequencies of the ceiling and floor constructional systems and determine the resilient mounting of buildings and building sections. With the aid of our measurement equipment we will conduct vibration measurements, location evaluations, building inspections and preservations of evidence. By dint of the Finite-Element-Method (FEM) we will simulate vibrations for the structure dynamic weighting and optimization of buildings and systems. Vibrations can have an effect on subjective well-being. In many cases a humming and buzzing noise occurs besides the vibrations. We are measuring the size of the vibration impact and the low frequent air borne noise and are therewith checking if it is conform to the relevant standard values. Vibrations can cause damage to buildings and constructions. These can range from small cracks in the wall to reduction of the usability of whole buildings. 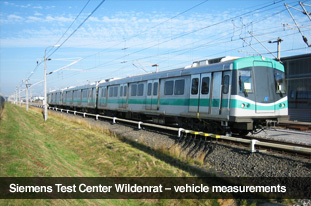 We can conduct the necessary measurements, calculations and verifications. When confronted with vibration intensive construction works we can install permanent surveillance systems which will trigger an alarm when limits are exceeded. 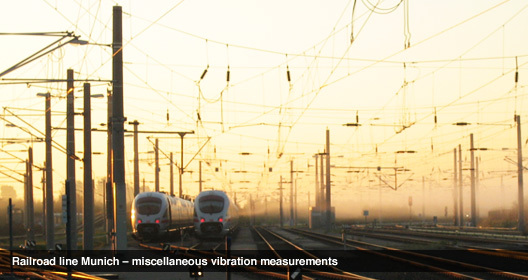 Vibrations can influence the functional capability of machinery and systems at their place of installation. In order to ensure the correct operability, the manufacturer instructions have to be accurately carried out in particular for: Microelectronic and precision-optical production facilities, analysis instruments in research facilities and measurement devices for quality control purposes. Also we are specialized in determining the reasons for material failure caused by vibrations in industrial, vessel and offshore facilities. Due to our experience we are able to identify problems and rapidly develop workable solutions to minimize periods of failure and downtime.